Comcast-Time Warner Cable merger in doubt: what might happen next? Comcast's headquarters building in Philadelphia. In marathon meetings on Capitol Hill on Wednesday, Comcast executives faced off with the skeptical government regulators who are scrutinizing the proposed merger of Comcast and Time Warner Cable. The Department of Justice went first on Wednesday. Then it was the Federal Communication Commission's turn. None of the parties involved are commenting on what happened. But the meetings reflect the fact that the merger review is now entering a new, more advanced phase. What could happen next? Will the $45 billion merger be blocked by the government? Could Comcast (CCV) walk away? "There are essentially three options: OK the deal, negotiate a consent decree to impose conditions, or sue to block the deal. The first is not in play," said Andrew Jay Schwartzman, a longtime media lawyer who is now affiliated with the Georgetown University Law Center. So the negotiations are where the action's at - unless the government agencies have already decided the merger must be stopped. Before we go any further, keep in mind that only a small number of people know for sure what's going on. Late in the day on Wednesday, Comcast issued a statement saying that "we do not believe it is appropriate to share the content" of the meetings. Almost all of the government's research into the proposed merger "consists of highly-confidential information, unknowable from the outside," Bernstein senior analyst Paul de Sa wrote in a note to investors on Monday. So there are lots of people on the periphery, speculating about the possibilities. It is certainly possible that Comcast could give up on the merger and blame the gloomy regulatory climate. The proposed deal has no "breakup fee," industry parlance for a financial penalty. But as recently as last week, Comcast expressed confidence that the merger will go through. What the cable company wants is more scale -- more subscribers in key cities like New York and Los Angeles -- and that's what Time Warner Cable (TWC) will give it. Comcast having more scale is exactly what some of the government attorneys reviewing the deal are concerned about. Bloomberg reported last week that some Justice Department staffers have almost finished a memo to the department's bosses recommending that the deal be blocked. If true, analysts at New Street Research wrote to clients over the weekend, "Is the purpose of the DOJ memo to litigate or negotiate?" That is perhaps the key question about Wednesday's meetings: litigate or negotiate? Negotiating means the Justice Department would enter into a consent decree with Comcast, essentially approving the merger but with conditions that the combined company has to abide by. The FCC's version of that is called an order. 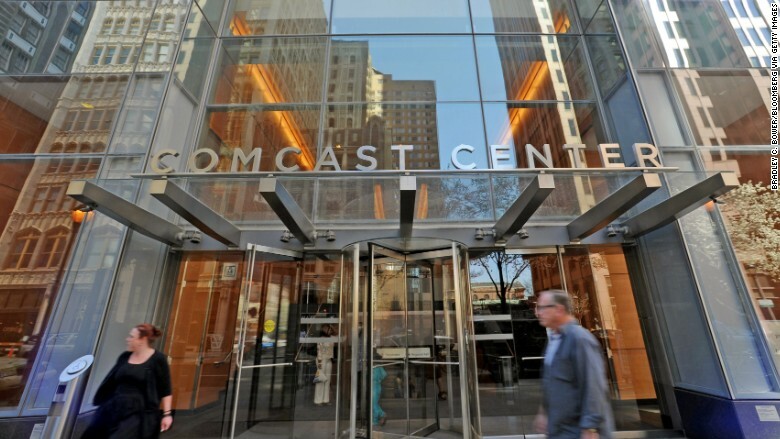 New Street Research cautioned that Comcast "has a difficult negotiation ahead." Comcast has tried to sweeten the merger by, for instance, pledging to expand "Internet Essentials," its program that seeks to provide $10-a-month broadband access to low-income households. The government could go further -- way further -- and argue for concessions that Comcast feels it has to reject, like the divestiture of key parts of the company or overly burdensome net neutrality requirements. "Politically, it may look better for DOJ to say 'We tried, but they walked,'" Schwartzman said. Comcast accepted a rather long list of conditions when it wanted the government to approve its acquisition of NBCUniversal in 2011. The Wall Street Journal reported on Tuesday that "similar types of promises would be a tougher sell with enforcers this time around, at least in part because there are questions about whether the earlier set of conditions have worked as intended." Senator Al Franken, the most vocal opponent of the merger on Capitol Hill, has raised a different reason why conditions aren't sufficient: because government regulators aren't equipped to make sure the conditions are enforced. So a lawsuit is the other possibility. The Justice Department sued to stop the AT&T/T-Mobile merger back in 2011. The companies gave up on the merger plan a few months later. But the analysts at Bernstein pointed out that if Justice formally challenges Comcast in court, "The process is not necessarily over if Comcast chooses to fight." The same is true if the FCC refers the case to a hearing before an administrative law judge. The Journal reported last week that the hearing is an option being considered by the agency, and then said Wednesday night that FCC staffers had recommended it. "This would appear to be a death sentence for the transaction," BTIG Research analyst Richard Greenfield wrote in an email Wednesday night. An FCC spokeswoman declined to comment. "Mergers are never put to hearing in order to approve them," former FCC commissioner Robert McDowell told the newspaper. "They are designated for a hearing in order to kill them." There, too, Comcast could fight. But the cable giant has been clear that it wants this merger to be approved by the summer. Comcast executive vice president David Cohen said last month that the company expects "the review should be concluded in the middle of the year." A government challenge could go on for many months, if not years, perhaps much longer than Comcast is willing to wait.